Are you adding gift cards to any Easter baskets this year? 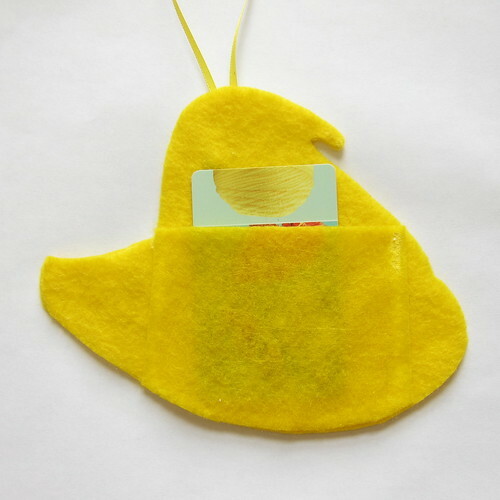 Why not make a cute Peeps inspired gift card holder to put them in? This holder is a cinch to make with just some felt, glue and a few easy stitched embellishments, it took me less than an hour to make this one. Mine is in classic yellow, but it would also look great in bright pink or blue. An optional ribbon at the top means it can be hung as a decoration when not being used as gift. 1. 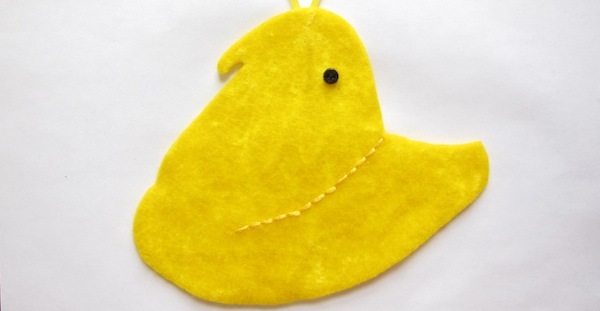 Print and cut out the peep pattern. 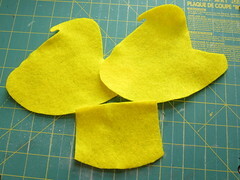 Cut two whole peeps out of the felt. 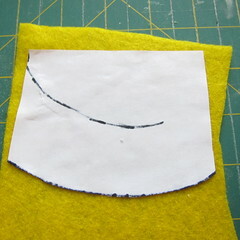 I like to glue the paper pattern to the felt with glue stick. It peels right off and I can use it multiple times. 2. 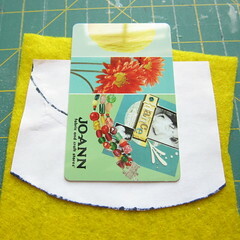 Cut the pattern on the dotted line and cut the bottom piece out of felt to make the pocket for the gift card. You can use the whole piece or cut the sides to make a smaller one like I did. Just make sure it is big enough to fit the card with room to glue the sides down. 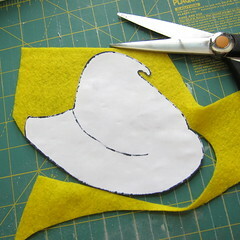 You will have three pieces cut from the felt. 3. 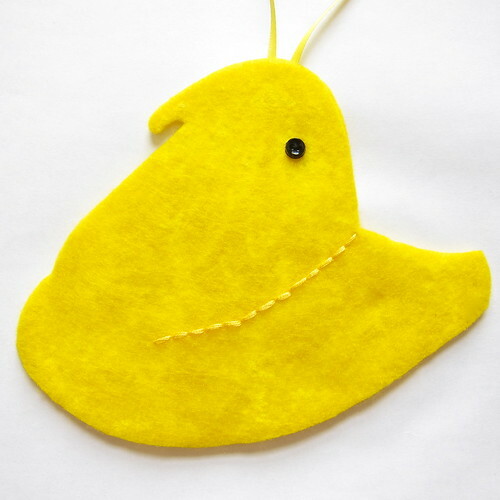 Chose one of the whole pieces to be the front of your peep. 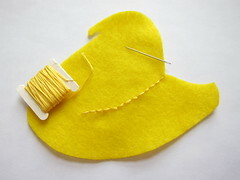 With matching embroidery thread stitch a line across the body of the peep as shown on the pattern. I did a simple backstitch using all six strands of floss. 4. With black thread, sew the button on for the eye. 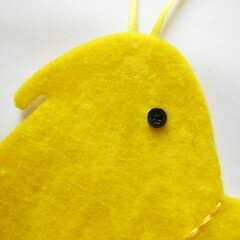 You could also just embroider on an eye or glue on a small piece of felt. 5. 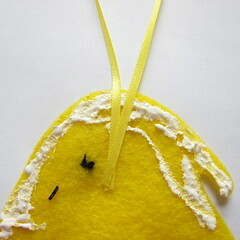 Turn the piece over and if you want to add a hanging loop to the top, glue the ends of the ribbon to the top of the peep’s head. Fill with a gift card for a sweet Easter present. 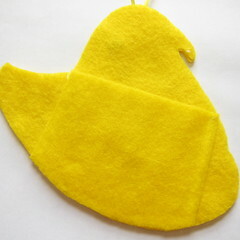 6 years ago by Kat in Craft Projects , Crafts , Easter , Holiday , Projects | You can follow any responses to this entry through the RSS feed. You can leave a response, or trackback from your own site.